(L-R) Angelina Cardella, Paramjit ( Prince) Singh, Courtney Bills, Meghann Daly and Briana Trentini. Congratulations to the five recipients of Wesley’s new nursing scholarship! Angelina Cardella, Paramjit ( Prince) Singh, Courtney Bills, Meghann Daly and Briana Trentini were awarded the five $1,000 scholarships from a pool of 9 applicants. 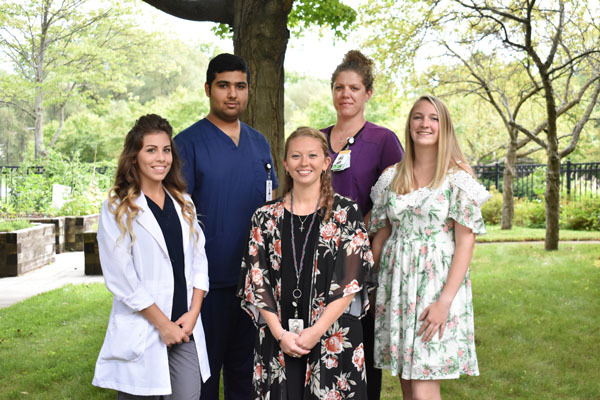 Thanks to an anonymous donor earlier this year, The Wesley Community received enough seed funding to establish this new nursing scholarship program. We plan to hold a fundraiser each year to continue this program and offer the scholarships annually. This new scholarship complements our existing Meinhardt Partnership Fund, which provides reimbursements of nursing education expenses.